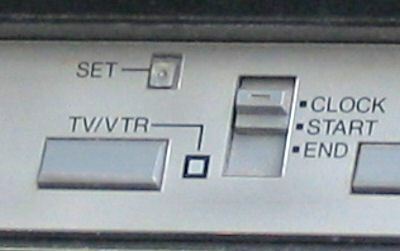 TV/VTR button on the V-51A The Toshiba V-51 was a fairly simple model, but more compact than its predecessors the V-31 and V-33. The model shown here being the V-51WS (the WS being the South African version). Like the V-31 and V-33, the V-51 was able to sense when a video input is provided and automatically switch from tuner to AV input. Most other machines have manual switching between the two modes. The V-51A model though has the TV/VTR button. The timer controls are directly on the front right of the unit providing a simple one week one program timer function. There were 8 channel buttons that are set using the controls under the top flap. 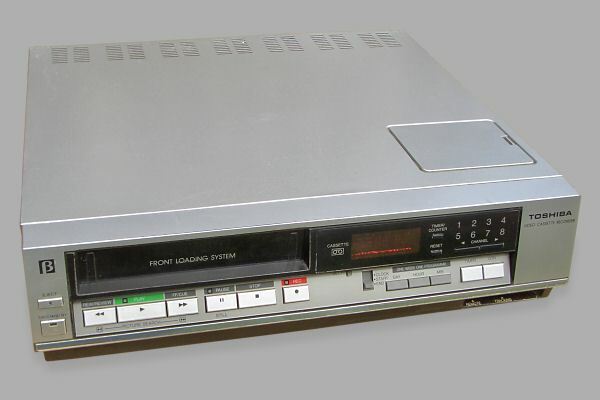 It has a digital tape counter, with an AM/PM clock. Many thanks to Noel Higgins for the pictures and information on this model.